when any current is passing about the electro-magnet. When the current is passing in a certain direction, the velocity of rotation of the particles moving, say counter-clockwise, is increased. Hence the period of vibration is smaller; I. e., the number of vibrations, or the frequency, is greater. In this case there will be a shifting toward the blue end of the spectrum by an amount corresponding to the amount of the acceleration. Those particles which are rotating in an opposite direction, i. r\, clockwise, will be retarded, the frequency will be less, and the spectral lines will be shifted toward the red. These two shiftings would account, then, for the double line. It is further clear that those vibrations which occurred in planes parallel to the lines of force of the' magnetic field would be unaltered. These vibrations would then produce the middle line, which is not shifted from its position by the magnetic field. 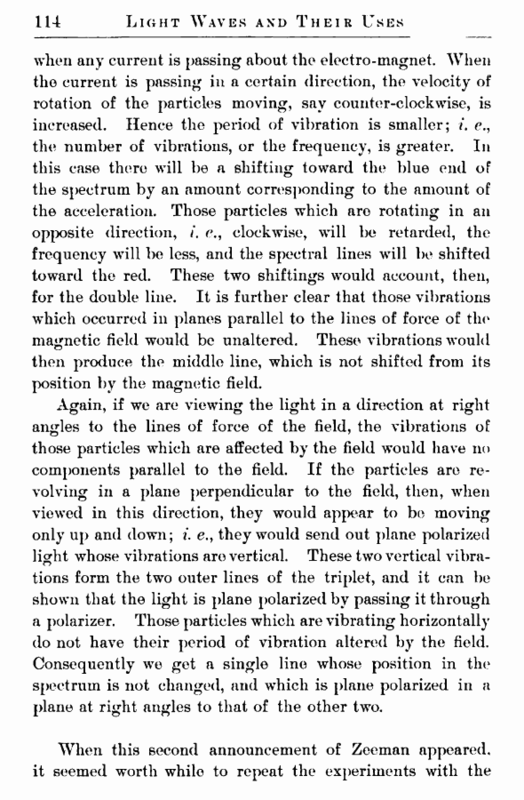 Again, if we are viewing the light in a direction at right angles to the lines of force of the field, the vibrations of those particles which are affected by the field would have no components parallel to the field. 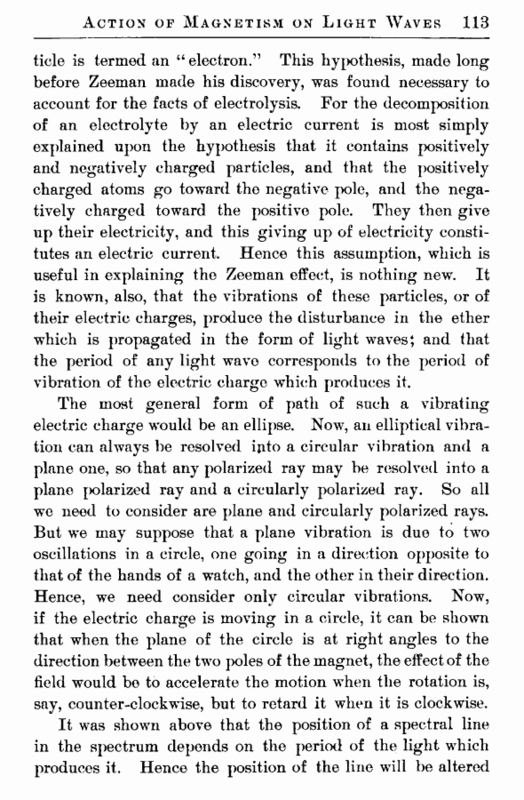 If the particles are revolving in a plane perpendicular to the field, then, when viewed in this direction, they would appear to be moving only up and down; i. e., they would send out plane polarized light whose vibrations are vertical. These two vertical vibrations form the two outer lines of the triplet, and it can be shown that the light is plane polarized by passing it through a polarizer. Those particles which are vibrating horizontally do not have their period of vibration altered by the field. Consequently we get a single line whose position in the spectrum is not changed, and wThicli is plane polarized in a plane at right angles to that of the other two.